This is a radar image of Mount Rainier in Washington state. The volcano last erupted about 150 years ago and numerous large floods and debris flows have originated on its slopes during the last century. Today the volcano is heavily mantled with glaciers and snowfields. More than 100,000 people live on young volcanic mudflows less than 10,000 years old and, consequently, are within the range of future, devastating mudslides. 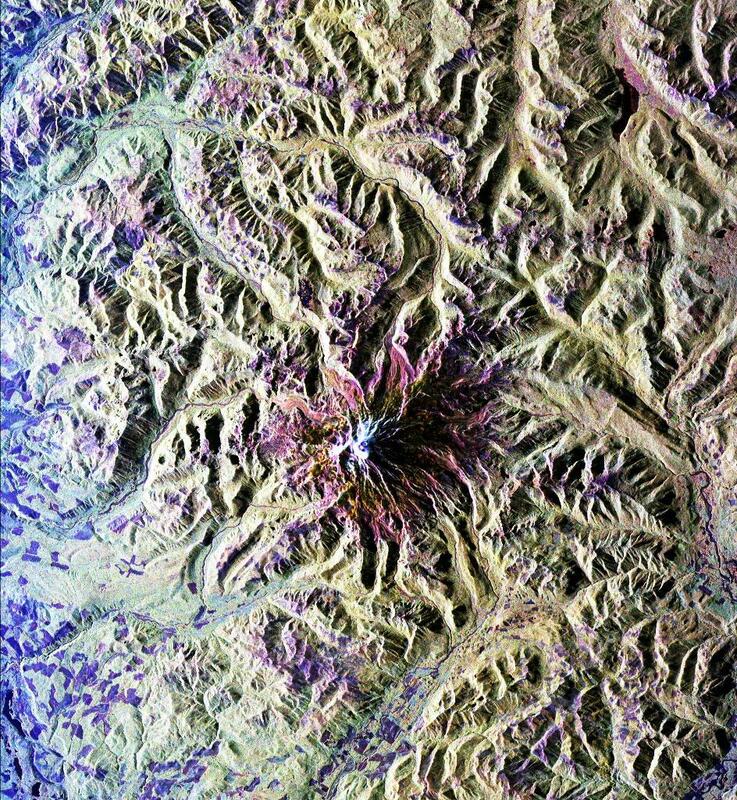 This image was acquired by the Spaceborne Imaging Radar-C and X-band Synthetic Aperture Radar (SIR-C/X-SAR) aboard the space shuttle Endeavour on its 20th orbit on October 1, 1994. The area shown in the image is approximately 59 kilometers by 60 kilometers (36.5 miles by 37 miles). North is toward the top left of the image, which was composed by assigning red and green colors to the L-band, horizontally transmitted and vertically, and the L-band, horizontally transmitted and vertically received. Blue indicates the C-band, horizontally transmitted and vertically received. In addition to highlighting topographic slopes facing the space shuttle, SIR-C records rugged areas as brighter and smooth areas as darker. The scene was illuminated by the shuttle's radar from the northwest so that northwest-facing slopes are brighter and southeast-facing slopes are dark. Forested regions are pale green in color; clear cuts and bare ground are bluish or purple; ice is dark green and white. 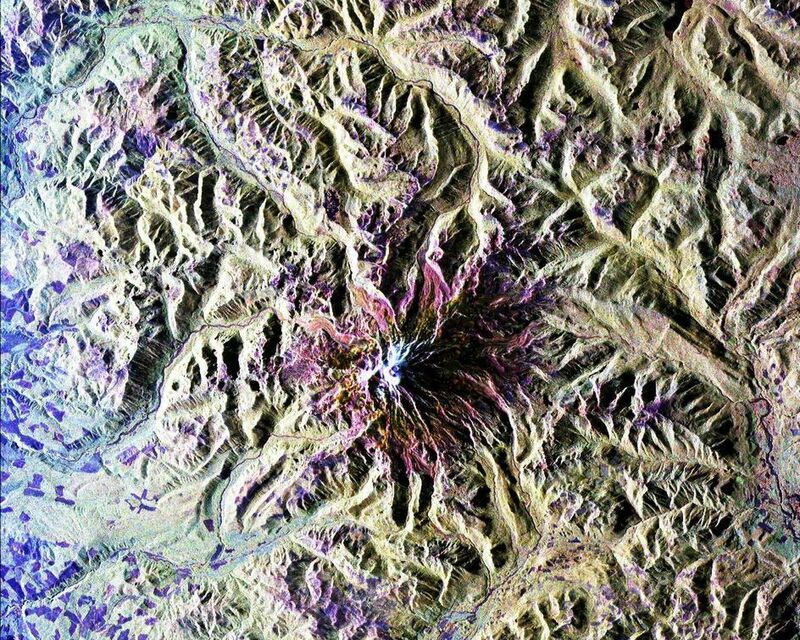 The round cone at the center of the image is the 14,435-foot (4,399-meter) active volcano, Mount Rainier. 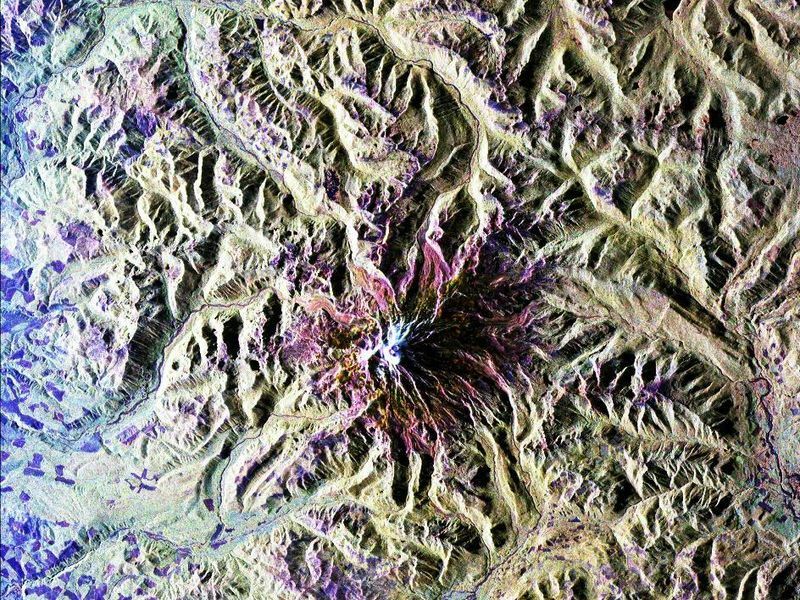 On the lower slopes is a zone of rock ridges and rubble (purple to reddish) above coniferous forests (in yellow/green). 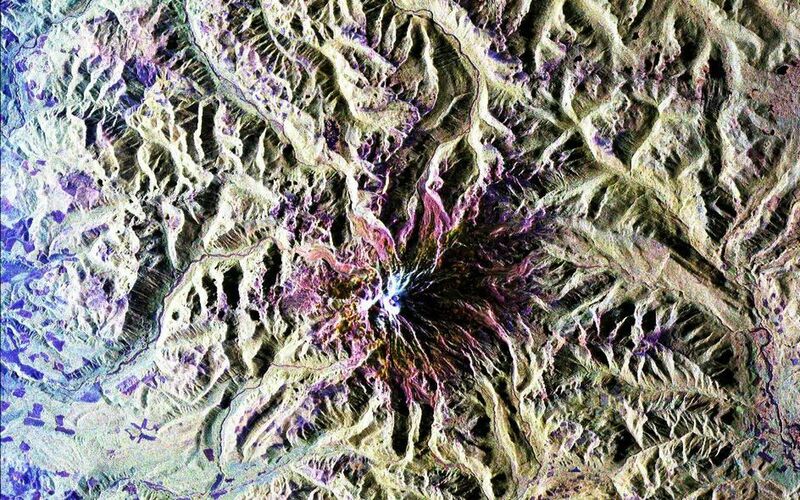 The western boundary of Mount Rainier National Park is seen as a transition from protected, old-growth forest to heavily logged private land, a mosaic of recent clear cuts (bright purple/blue) and partially regrown timber plantations (pale blue). The prominent river seen curving away from the mountain at the top of the image (to the northwest) is the White River, and the river leaving the mountain at the bottom right of the image (south) is the Nisqually River, which flows out of the Nisqually glacier on the mountain. The river leaving to the left of the mountain is the Carbon River, leading west and north toward heavily populated regions near Tacoma. The dark patch at the top right of the image is Bumping Lake. Other dark areas seen to the right of ridges throughout the image are radar shadow zones. Radar images can be used to study the volcanic structure and the surrounding regions with linear rock boundaries and faults. In addition, the recovery of forested lands from natural disasters and the success of reforestation programs can also be monitored. Ultimately this data may be used to study the advance and retreat of glaciers and other forces of global change. Spaceborne Imaging Radar-C and X-band Synthetic Aperture Radar (SIR-C/X-SAR) is part of NASA's Mission to Planet Earth. The radars illuminate Earth with microwaves, allowing detailed observations at any time, regardless of weather or sunlight conditions. SIR-C/X-SAR uses three microwave wavelengths: the L-band (24 cm), the C-band (6 cm) and the X-band (3 cm). The multi-frequency data will be used by the international scientific community to better understand the global environment and how it is changing. The SIR-C/X-SAR data, complemented by aircraft and ground studies, will give scientists clearer insights into those environmental changes which are caused by nature and those changes which are induced by human activity.